Ministers have approved Nottingham City Council’s new plan to tackle air pollution in the city centre but other key councils have missed the latest Government deadline. 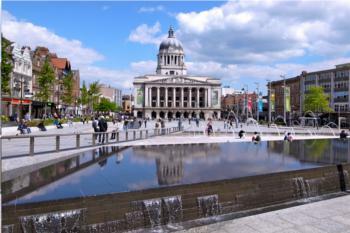 Nottingham, which is one of five cities originally directed to implement a charging Clean Air Zone (CAZ), is the first local authority to have its air quality plan approved. Environment department Defra said Birmingham and Leeds were the only other councils out of the five required by Ministerial Direction to produce a Full Business Case, to have handed one in. Southampton and Derby councils have again missed a deadline to submit plans. In September environment minister Thérèse Coffey wrote to Southampton and Derby councils, which had indicated that they would miss a deadline that month, warning of ‘serious associated consequences’ if a further deadline of 30 November was missed. Earlier this month Southampton City Council said it will submit its business case by 31 January 2019. In response to an enquiry from Transport Network, it has confirmed that this remains its position. As the deadline expired at the end of last week, Defra repeated its warning of the ‘serious associated consequences’ for the two councils. On Sunday (2 December), Derby City Council said it had submitted its 'latest business case' to Defra. This appears to be a response to a request from Dr Coffey for the council to provide an already overdue outline business case. The council said that 'further development on the business case will be made during December and after Christmas'. Defra said Nottingham had been working with its officials and the Department for Transport to identify measures to ‘reduce levels of pollution in the shortest possible time and deliver compliance with legal air quality limits’. Nottingham’s plan, which does not include a CAZ was cleared by ministers, who have issued a Ministerial Direction for it to be implemented.